A classic dry white wine fermented in stainless steel. Fruit forward on the palate and perfectly balanced. This is a pure, unoaked classic dry wine. 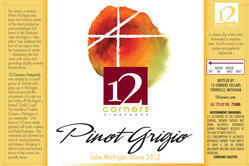 Delicately gragrant, fruit forward on the palate with light and creamy lemon-citrus flavors.